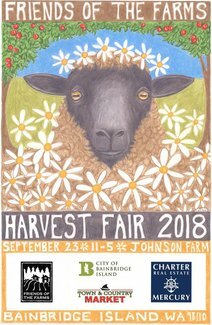 Bainbridge Island 4-H Club: 4-H enjoyed participating in the Harvest Fair! Many thanks to our dedicated 4-H members who volunteered their time on Sunday afternoon! In an apple filled orchard, our members cheerfully ran a fishing pond game for the community and a petting farm for the children! How exciting for the community to enjoy a treat together with bunnies, dogs, a miniature horse and a goat. Way to go Bainbridge Island 4-H!